A major challenge in conservation is developing scientific theory into practical tools that stakeholders can use for living sustainably with wildlife in their backyards. Coexistence is a fragile state, often imbalanced by opposing pressures from human development and species protection. Keystone predators play important roles in maintaining resilient ecosystems by affecting prey spatial movement and behavior, but they can also threaten human well being. My research aims to quantify patterns of species interactions to identify ecological drivers useful for guiding management and stakeholder decision-making. To learn more about the conservation outcomes of the projects below, read my scientific publications and popular articles and check out media coverage of my work. Birding in the fynbos of South Africa. Our understanding of competition between carnivores can play a large role in how we manage species. Managers have traditionally thought that as dominant competitors, lions spatially and temporally displace leopards, causing these spotted predators to seek less optimal habitats and activity periods. Using an extensive dataset of camera trap images collected from 19 reserves over 3 years across South Africa, we're using 2-species conditional occupancy models, a relatively new tool in occupancy analysis, to examine competitive interactions between these big cats across space and time. Our results will help inform how lions and leopards share space to drive ecosystem function as top predators. This young leopard's selfie will help inform how leopards coexist with their dominant competitor, lions. Photo by Ross Pitman, Panthera. Trophy hunting plays a significant role in motivating the conservation of wildlife and habitat in Africa, yet excessive harvest in some areas is driving declines in species such as the African lion. Simulation models suggest that sustainable lion trophy hunting can be accomplished by harvesting adult males that have raised cubs to independence, or males 5-8 years old (depending on site specific dynamics). Yet the feasibility of age-based trophy hunting depends on the existence of reliable physical characteristics for aging as well as hunters' abilities to accurately age. To test whether age-based hunting would be possible, we used a large dataset of photos of known-age males from ten sites across Africa to measure change in ten phenotypic traits with age. Results revealed four age classes with distinct characteristics that changed predictably with age: 1-2.9 years, 3-4.9 years, 5-6.9 years, and ≥7 years. We then tested the aging accuracy of professional hunters and inexperienced observers before and after a brief online training about lion aging. Before training, hunters accurately aged more lion photos (63%) than inexperienced observers (48%); after training, both groups improved (67-69%). Hunters overestimated 22% of lions <5 years as 5-6.9 years (unsustainable offtake) but only 4% of lions <5 years as ≥7 years (sustainable offtake). Due to the lower aging error for males ≥7 years, we recommend 7 years as a practical minimum age threshold for trophy hunting male lions. 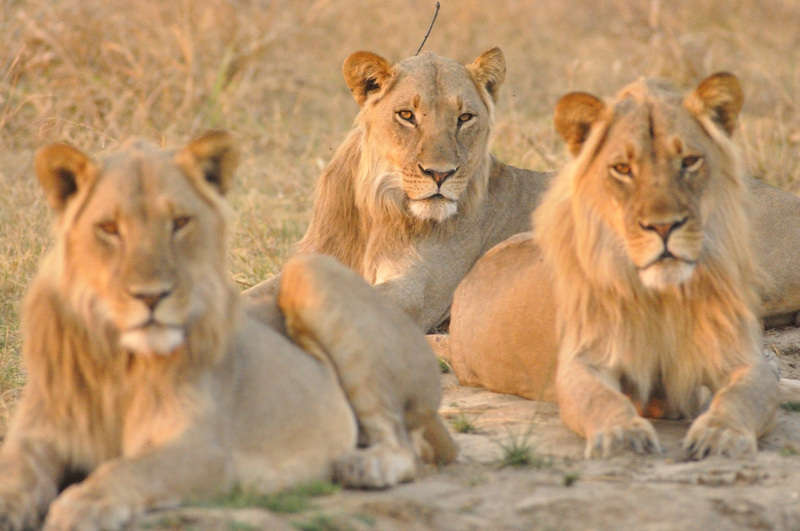 3 year-old lions in Hwange, Zimbabwe. Photo by WildCRU. Our study indicates that age-based hunting is feasible for sustainably managing threatened and economically significant species such as the lion, but must be guided by rigorous training, strict monitoring of compliance and error, and be supported by conservative quotas. Our study also demonstrates methods for identifying traits to age individuals, information that is critical for estimating demographic parameters underlying management and conservation of age-structured species. ﻿Visit our outreach website on lion aging, AgingTheAfricanLion.org, and test your lion aging ability! Despite the importance of predators in driving ecosystems, large carnivores pose threats to human livelihoods that create challenges for conservation. Innovative tools are greatly needed to reduce carnivore attacks on livestock and resulting retaliations against carnivores. Spatial risk modeling is an emerging method for assessing the spatial patterns of predator–prey interactions which can have implications for mitigating human-carnivore conflict. In the last 10 years, 18 studies have used spatial risk modeling to understand human-carnivore conflict globally. Most of these studies have used risk maps to help livestock owners and managers identify top-priority areas for implementing carnivore deterrents, with some efforts achieving >90% reductions in attacks by carnivores (Miller 2015, Biodiv & Conserv). 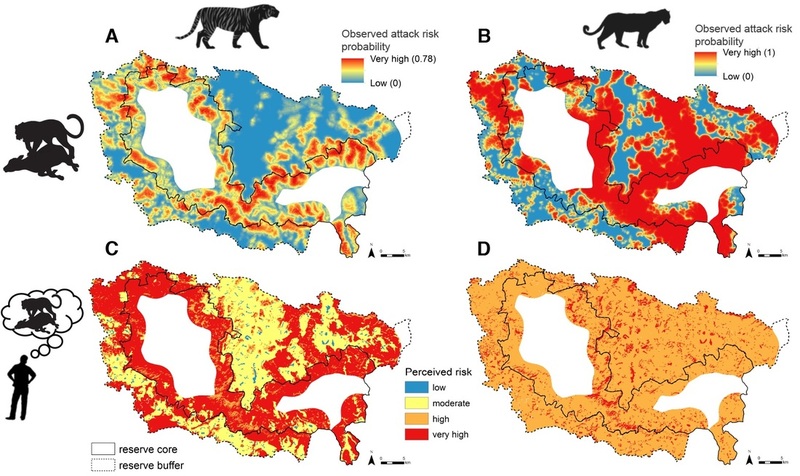 To further develop risk modeling for understanding carnivore attacks on livestock, I studied tiger and leopard attacks on livestock in Kanha Tiger Reserve, India. Cattle and buffalo were most at risk in dense forests away from villages and roads, whereas goats were most often killed in open vegetation near villages (Miller et al. 2016, Reg Enviro Chg). Tigers killed most often in dense forest away from human presence (villages and roads) whereas leopards killed livestock in open and moderate vegetation near water and weren't impacted by human presence. 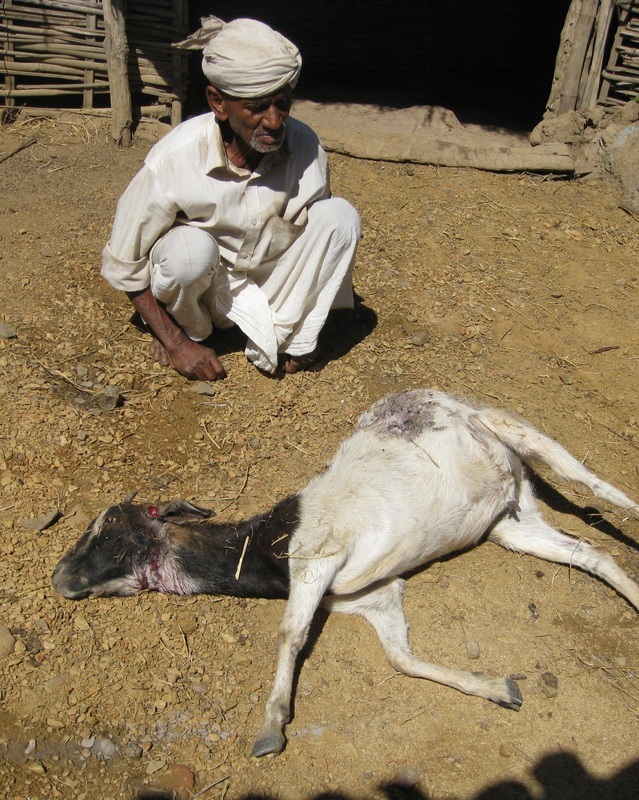 An owner with his goat killed by a leopard. To better understand which spatial scales are most appropriate for modeling predation risk from large stalking carnivores, I generated risk models at 20, 100, and 200-m spatial grains. Validation against known kills revealed strong predictive accuracy for only the 20 m model, the resolution best representing the kill stage of hunting for large carnivores that ambush prey, like the tiger (Miller et al. 2015, Ecol & Evol). After interviewing livestock owners, I discovered that people's perceptions about gradients of carnivore threats closely mirrored realities of where livestock depredation occurs (Miller et al. 2016, PLOS ONE). This differs from communities in other landscapes and suggests that efforts to prevent human-carnivore conflict can focus on a more advanced stage of mitigation to implement effective methods for protecting livestock, rather than focusing on basic education about carnivores. Despite - or perhaps because of - the fact that livestock owners in Kanha understand the gradient of risk from tigers and leopards, may allow their livestock to graze freely across the landscape. Because owners are generally satisfied with the highly-efficient level of financial compensation for livestock, and rarely retaliate against carnivores, Kanha appears to represent a role model example of human-carnivore coexistence. Livestock owners' perceptions about distributions of carnivore threats (bottom) closely aligns with the realities of patterns of where livestock are attacked by tigers (left) and leopards (right). Fig from Miller et al. 2016 (PLOS ONE). This work also revealed that livestock owners who lost animals to wild carnivores for the first time expressed the most interest in trying new methods for protecting livestock compared to people who had previously lost livestock (Miller et al. 2016, PLOS ONE). These first-time owners represent an engaged, interested audience that government agencies and conservation groups should target to share information and financial subsidies for improving methods for protecting livestock and preventing retaliatory killing of carnivores. In Kanha, the Field Director used our risk maps to identify suitable areas for building fences to keep livestock out of the densely forested protected core zone. Across the world, researchers have likewise applied risk models and hotspot maps for a variety of mitigation measures including targeting highest-priority households for subsidized predator-proof livestock enclosures (Tanzania), classes for livestock owners on financial compensation (Mexico), and awareness posters distributed in high-risk communities (India; Miller 2015, Biodiv & Conserv). Tiger vs. Cow: Risk Models Help Beat the Odds (Conservation India). Mapping tiger attack hotspots to reduce conflict (Conservation Corridor). Tools for saving tigers (Yale F&ES blog). Study could help reduce tiger killing (Yale Daily News). Live and let live (Frontline). Link to original article and photos (make a free account to access) or download PDF. Reading the bones: In the field with a depredation detective (Sage Magazine). Following the hunt: Tracking livestock kills to reduce villager's losses in India (Scientists Without Borders). Time of attack on cattle (a), buffalo (b) and goats (c). From Miller et al. 2016 (Reg Envio Chg). Ecologists have long searched for a framework of a priori species traits to help predict predator–prey interactions in food webs. Empirical evidence has shown that predator hunting mode and predator and prey habitat domain are useful traits for explaining predator–prey interactions. Yet, individual experiments have yet to replicate predator hunting mode, calling into question whether predator impacts can be attributed to hunting mode or merely species identity. We conducted research in the Connecticut fields of Yale Myers Forest to investigate how predator hunting mode and habitat domain influence prey anti-predator behavior. We carried out behavioral observations in field microcosms to test how six spider species displaying a gradient of hunting modes - from sit-&-wait to sit-&-pursue to active - influence grasshopper mortality, habitat domain and activity levels. We found that predator hunting mode predicted both density- and trait-mediated effects on prey, generating further evidence that hunting mode is a strong predictor of prey anti-predator behavior. Piscarina mira, a sit-and-wait spider with strong fear effects on prey. Spider hunting mode could be used to predict how grasshopper prey respond in their distance moved (a) and horizontal (b) and vertical (c) domain. From Miller et al. 2014 (J Anim Ecol).